Laguna Beach resident TJ Fink donates blood drawn by Hoag blood specialist Betty Sifuentes. 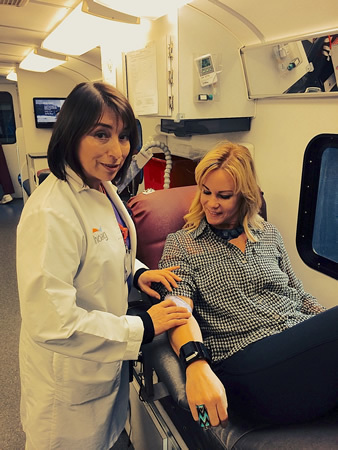 A tiny clinic on wheels from Hoag Hospital will roll into the parking lot of the Albertson’s market in South Laguna on Thursday, Feb. 5, allowing people running errands to also stop by and donate blood. All donations will support patients in need at Hoag Hospital’s campuses in Irvine and Newport Beach, says an announcement by TJ Fink, a realtor with the local real estate company Veytia Group, organizing the 10 a.m. to 3 p.m. drive. Veytia Group owner John Veytia believes in giving back to the community, Fink said in a statement.